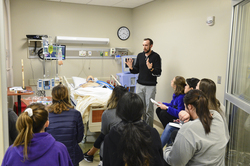 Justin Pelham, a clinical instructor for Stephen F. Austin State University's food, nutrition and dietetics program, discusses how the medical equipment works and correlates with nutrition during a simulation in the DeWitt School of Nursing. NACOGDOCHES, Texas - Trading a typical classroom for a simulated intensive care unit within Stephen F. Austin State University's DeWitt School of Nursing, students in a medical nutrition therapy course gather around Justin Pelham, their instructor. A high-fidelity mannequin rests on a hospital bed, with its chest rising up and down simulating a real-life patient. With tubes connected to the mannequin, Pelham, a clinical instructor in the School of Human Sciences, explains what a registered dietitian would need to know and do in this clinical setting. For the second year in a row, Pelham has partnered with the DeWitt School of Nursing to offer food, nutrition and dietetics students the opportunity to participate in a nutrition simulation to practice concepts learned in the classroom. "Taking students to a different setting helps them see and understand concepts in a new light," Pelham said. "The nutrition simulation is a great way to expose students to equipment utilized in the clinical environment and provide real-world application in an ICU setting." During the simulation, the class discussed tube feedings, parenteral nutrition, different respiratory masks, urine output, dialysis catheters and additional intravenous fluids. Then, students were tasked with completing an independent case study regarding one of the disease states covered in class. "Students had to apply their clinical information in order to figure out their patients' total caloric, protein and fluid needs based on the information provided," Pelham said. "The nutrition simulation provides practical experience for the students to think critically and quickly - similar to real-world situations during their dietetic internship." The medical nutrition therapy course is focused on teaching students how to conduct nutrition assessments centered on nutrition-related diagnoses, interventions and monitoring/evaluation. The students also learn about chronic conditions, such as heart disease, hypertension, strokes, diabetes, pancreatitis and metabolic stress. To learn more about SFA's food, nutrition and dietetics program, visit sfasu.edu/hms/101.asp.